We will have three separate waves for the race this year. We will not assign waves ahead of time, so the waves will be self-seeded. We ask that anyone planning on running 29:00 or faster, line up in Wave 1. Anyone planning on running 29:01 or slower, please line up in Wave 2. Anyone planning on walking, please line up in Wave 3. Participants planning on starting with Wave 2 or 3 will line up behind the Wave 2/3 signs. After Wave 1 starts, Wave 2 will be walked to the start line and runners in Wave 2 will start at 9:05. Wave 3 will be walked to the start at 9:08. Remember, the race is chip timed, so your official time will not start until you cross the start line. 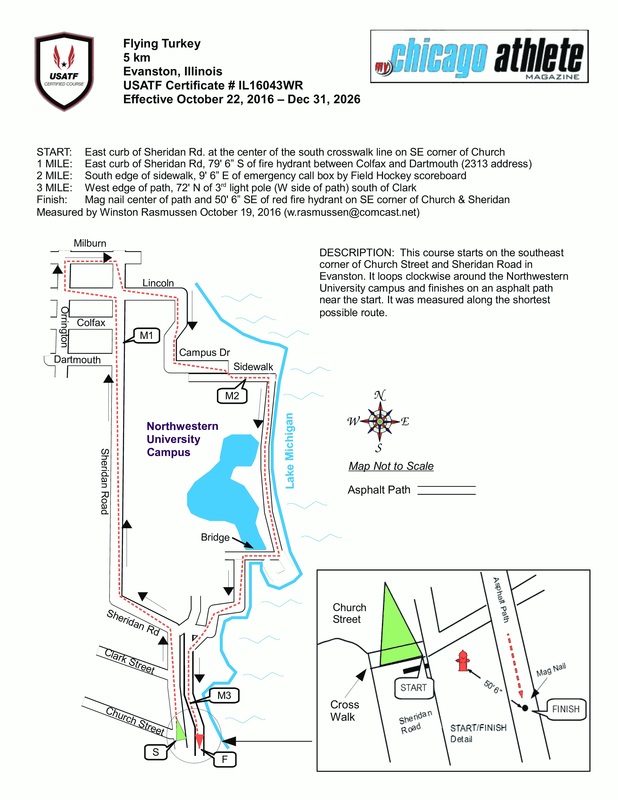 A certified 5K course complete with aid stations along the route. – You must be in good health and physically prepared to take on the challenges of a 5k. – You may be required to show a photo ID or confirmation email to pick up your race number and chip. -Race numbers are required in order to participate. -Coaches, dogs, in-line skates, skateboards, and bikes will not be allowed on the course. -Strollers are allowed, but anyone pushing a stroller must start in the back. – Under no circumstance are you allowed to give your registered race number to another individual. If discovered, you will be banned from any future Evanston Flying Turkey 5k Events.